A trip to Tullymore is not so much a round of golf as an exploration. Carved from western Michigan pine and hardwood forests, and passing through wide expanses of marshland, it exudes a sense of adventure. 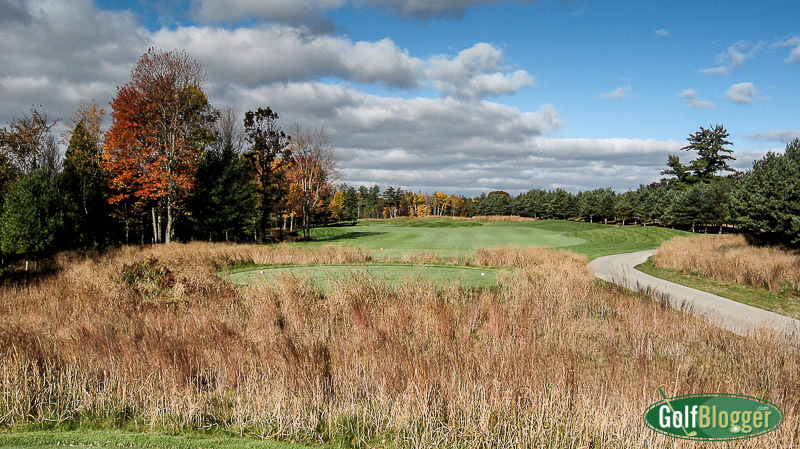 And Jim Engh’s design offers so many options—so many approaches—that even those who play there on a regular basis must surely make new discoveries each time out. Tullymore has drawn rave review from golf writers, and Golf Digest has ranked it as the number 14 public course in the country. 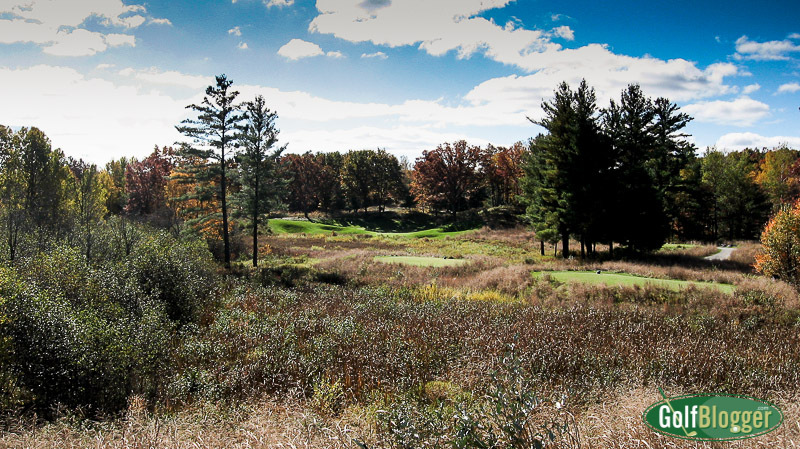 My experience with top 20 golf courses is limited to just one other (#18 Forest Dunes), but I have no trouble imagining that Tullymore deserves its place on the list. I also have a hard time imagining just how special some of the others must be. For me, the genius of Jim Engh’s design is in the huge number of options most holes offer. Rather than forcing you to play a particular kind of shot, Engh entices you. Landing areas are wide, but not all locations are created equal. I found it a tantalizing puzzle. After each hole I played, I immediately wanted another crack at it. Some golf writers have described Tullymore as having an “art deco” look. I didn’t see it. In fact, if you’re going to compare it to an artistic style, I’d say it was more American Primitive. (That’s not an insult; I enjoy that style immensely). The design is stylized, yet at the same time, unforced. At any rate, I appreciated it. The sculpted mounds and long snaking sand traps are not “natural,” but still somehow fit the terrain. The course layout is somewhat unusual. The front nine plays to a 35, with its trio of par threes—two of which are back-to-back. From the tips, it plays to 3,302 yards. The back nine has three par fives—monsters all, with the shortest at 535 yards. The par fours also are huge, with one measuring 458. All told the back nine is par 37, and measures 3846 from the tips. It’s not standard. But Tullymore’s routing works very well. Engh clearly did not force the holes into position, but rather took what was was offered. If the landscape suggested back-to-back par threes, then that’s what he routed. A side effect of this is that the course is very walkable (long, but not taxing). Each tee follows naturally after the previous green, without overlong interhole treks. Tullymore has five sets of tees. The longest—the Silver—clocks in at 7,148. At the other end, the Golds measure 4668. But the distances don’t tell nearly the whole story. Playing from different tees not only changes the distance, in many instances, it changes the entire look of Tullymore’s holes. The par four sixth (above) is a good example. 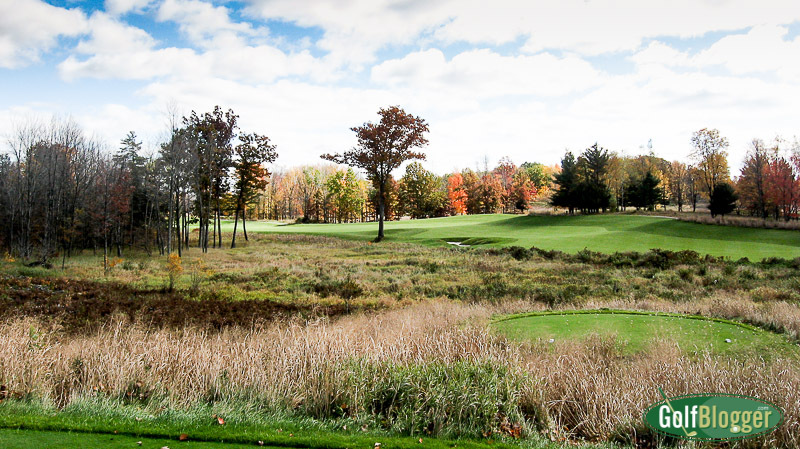 From the silver, the fairway actually runs perpendicular to the tee, forcing a player to carry an enormous stretch of swamp, and land the ball across the width of the fairway. As you drop down in tees, however, the carry becomes smaller, and the angle to the fairway easier to handle. The monster par three twelfth (above) is another case in point. From the back tees, it’s a 257 yard shot to a green that’s barely visible behind a huge mound (or small hill, as you may see it.) Your shot from that distance has to come in high enough to clear the hill. However, as you move to the shorter tees, you get a better view of the green, and the mound becomes less of an issue. You can see how it all plays out with the dramatically different slopes and ratings. At its longest, Tullymore is a 74.8/148. The middle Blues are a 69.5/135; from the shortest, it’s a 66.8/115. The greens at Tullymore are smooth and true, almost always producing the sort of shot I expected. They’re interesting, but fair. More than once, I made a long, unexpected putt to save par. As you might expect, overall conditions at Tullymore were outstanding, even at the end of a long season. There must be an army of golf gnomes keeping it up. I fear, however, that Tullymore’s greatness may be short-lived. Part of its charm lies in its solitude—the sense of being out of place and time. 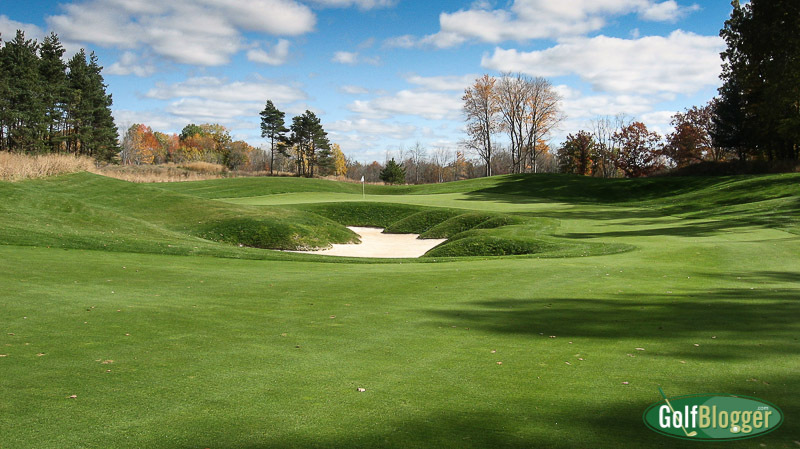 But Tullymore has always been planned as part of a large golf community, with homes and condos lining the fairways. Construction is well underway, and in many places, I thought the buildings intruded jarringly into the golf space. On the par 4 ninth, rows of condos hung over the right side of the fairway like cliff dwellings on an Arizona mesa. An oddly placed home on 18 gave me a close up view of the occupants living room. Earthmover scars were visible just beyond a great many holes. But that’s how they’re going to pay for this course, so while disappointed, I completely understand. My advice is to take a trip to Tullymore soon—while it still is a special place. You won’t be disappointed. I just saw your blog for the first time. It seems that you have an appreciation and feel for the “art of golf”. It is very rewarding when someone “gets” what I am doing. Trust me, the “old guard” is doing a great job of “guarding the old”. Mind set that is. 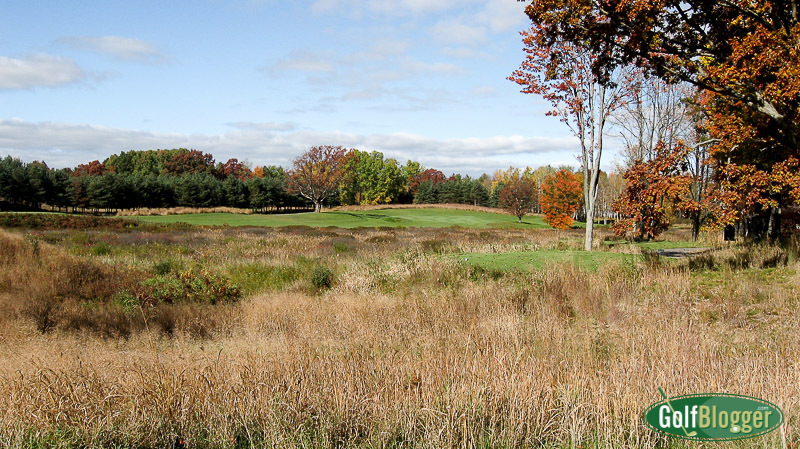 The Tullymore Golf Course Review was originally published November 3, 2008.